Ann and Serge in their studio. 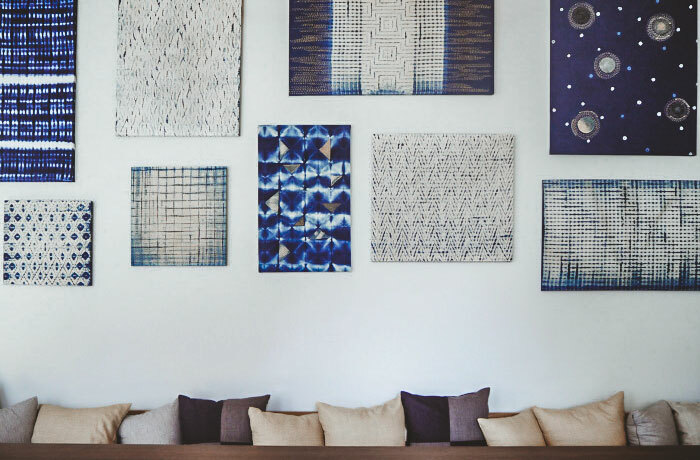 Slow Stitch, a textile studio based in Chiang Mai, Northern Thailand, creates the most exquisite textile patterns. 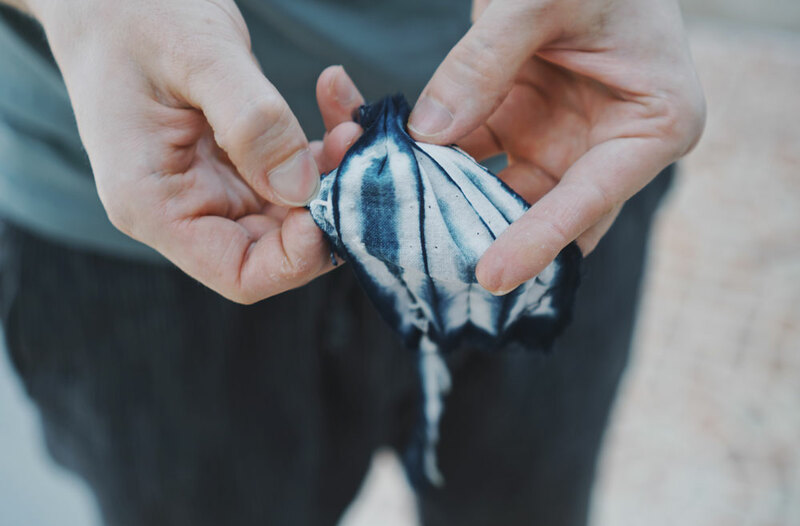 Their unique designs are achieved by experimenting with natural dyeing and Shibori, a traditional Japanese technique that uses an indigo dye combined with folding, stitching and compressing methods to create the patterns. 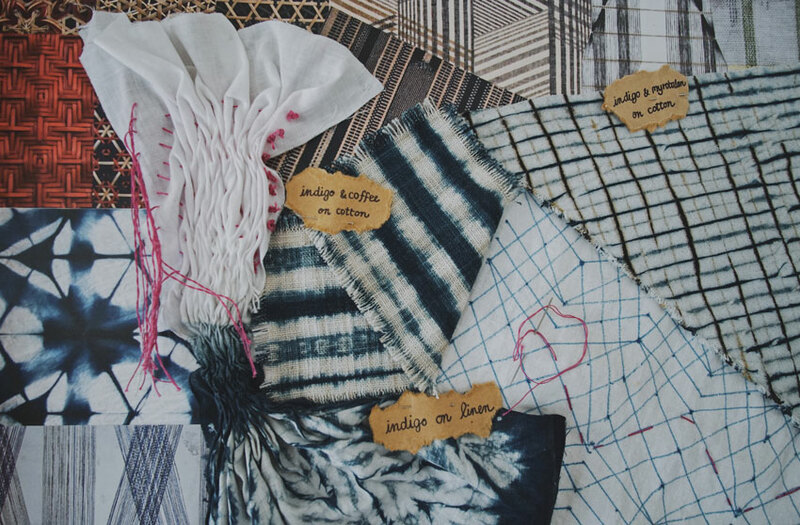 Formed in 2015 by makers Kanchalee “Ann” Ngamdamronk and Sergey “Serge” Tishkin, the brand is already dipping into new and exciting textile techniques beyond Shibori, of which an exciting world awaits! Experimenting with various techniques and materials. How did you two fall into Shibori? Ann: My background is in textile design. After I graduated, I did my Bachelor's degree in London and then came back to work in Bangkok for two years. Eventually, I got to a point where I wanted to explore something new so I went to Japan to learn under a Shibori craftsman. I stayed there for two months, learning all about Shibori as well as indigo and natural dyeing techniques. That’s where I met Serge, who at that time was studying under the same craftsman. After that, I came back to Bangkok and was freelancing whilst continuing to experiment with Shibori techniques on my own. During that time, I was in contact with Serge (who remained in Japan) as we had decided we wanted to start something together related to Shibori. Serge: I’m originally from Siberia, Russia. I moved to Japan in my late teens and lived there for a number of years. I met the Shibori teacher randomly: I was out in the countryside in a semi-rural place so it was unusual to see anyone that wasn’t Japanese. I was in a parking lot and I saw another foreigner and naturally, we started talking. I learned that he had been living in a nearby village for 25 years, raising silkworms and doing indigo dyeing. I thought that was really cool and eventually, I became one of his students. Stitching fabric in preparation for the process of indigo dyeing. Fabric that is prepared and ready to be dyed. 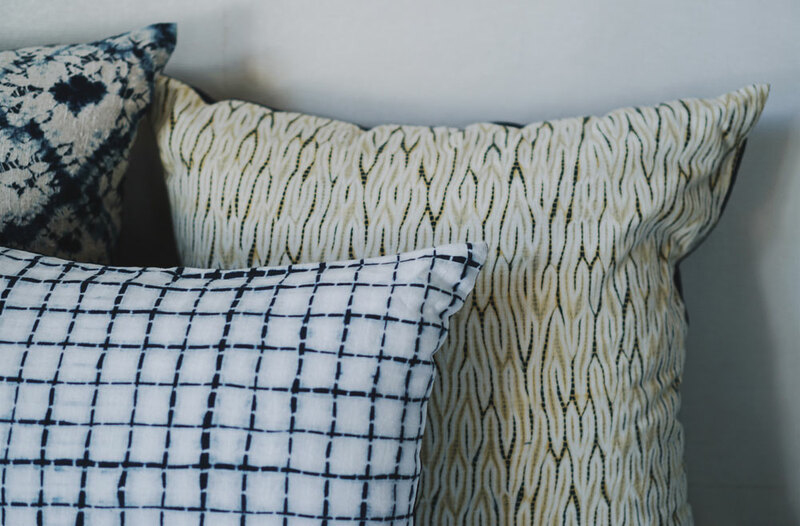 Can you explain how you make Shibori patterns? 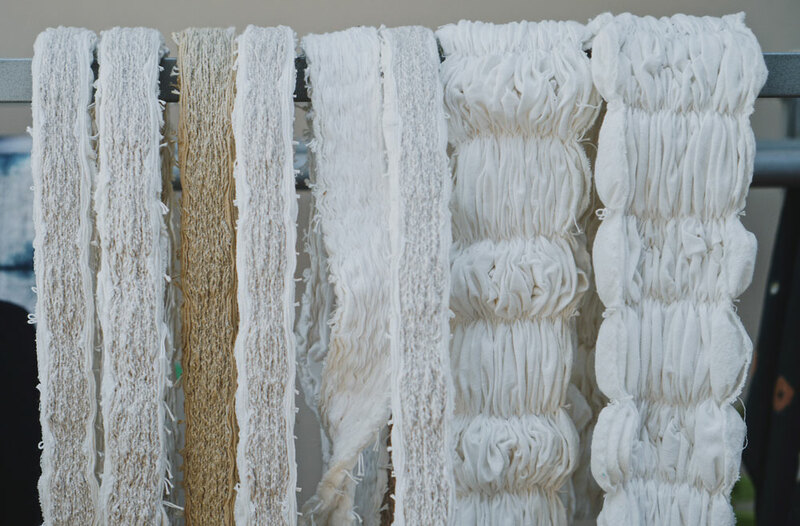 Serge: In Shibori, everything starts out as a plain undyed piece of fabric. 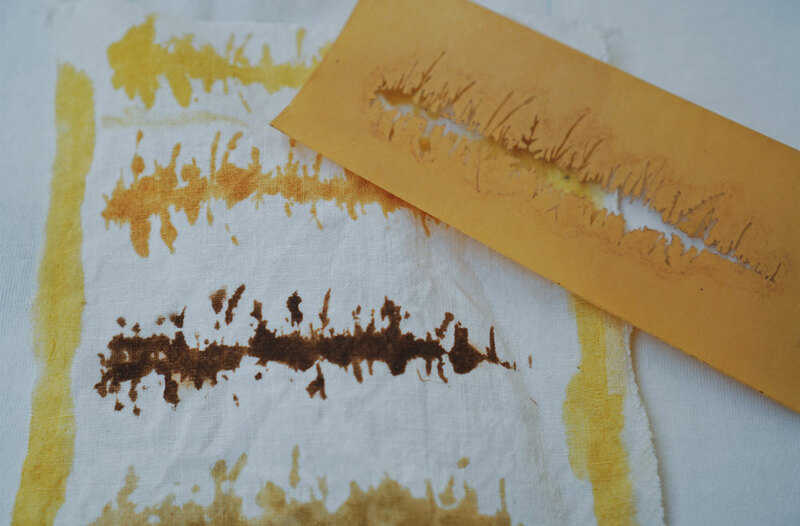 We draw patterns onto the fabric using a temporary ink pen to create a template of where to stitch (the ink later disappears in water). Each pattern has a slightly different stitching template, some more complex than others. Once marked out, we use needle and thread and hand stitch the fabric along the template. 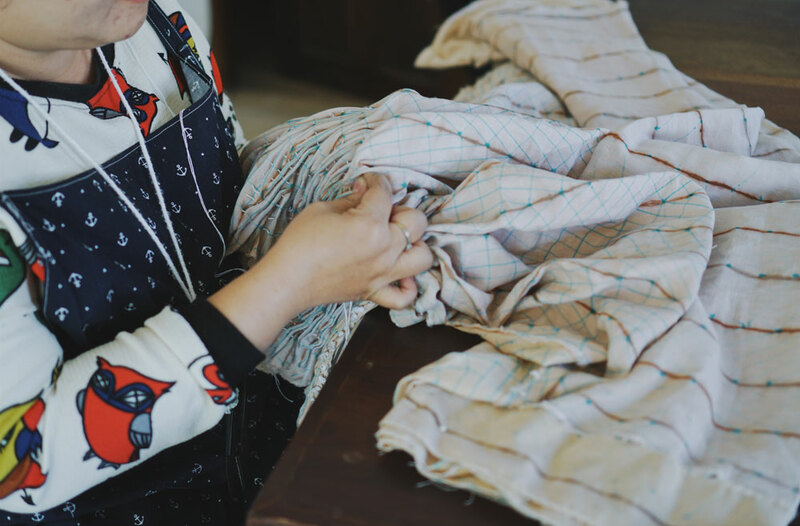 After stitching, we’ll pull the loose threads to tighten the fabric to ensure the dye doesn’t get into the crevices — that’s what creates the patterns. We’ll then dye it in indigo or in one of the natural dyes and once it has dried we will remove the threads to reveal the final pattern, which is always a surprise. Dyeing the fabric in the indigo dye vat. The colour turns dark blue as it oxidises. Can you explain the process of making your own dye? Ann: With natural dyeing, you pick leaves or flower petals (or any plant-based materials) and boil them to extract the colour. In the same dye pot, you’ll heat up the mixture, incorporate some ionic salts to fix the colour and once that’s dissolved you put the fabric in and leave it to soak for a few hours, stirring occasionally until it reaches the desired colour. 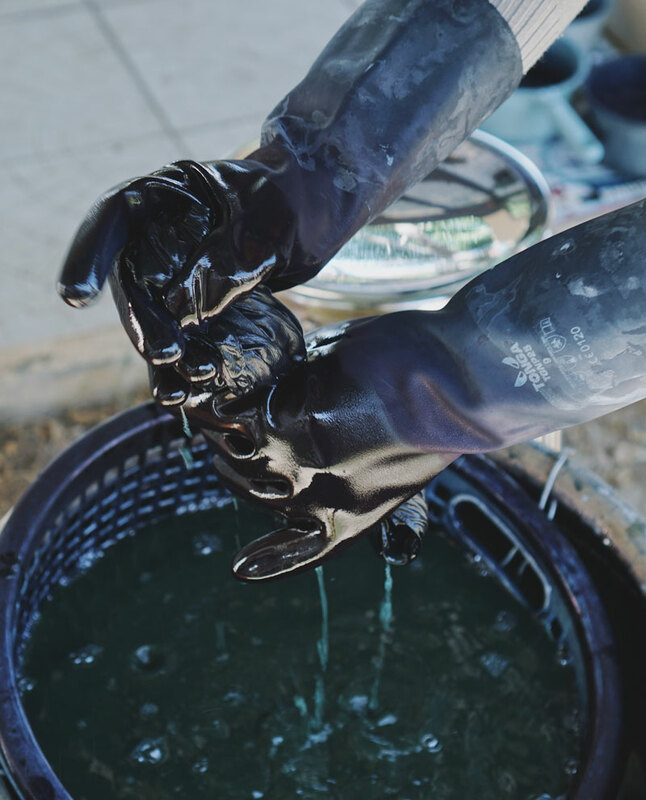 With indigo dyeing, the indigo extract from plants is not water soluble so there’s a different extraction process. We don’t do this process ourselves because we don’t farm the indigo, we buy it. But to extract the indigo dye, you harvest the plant and soak it in cold water for a day. 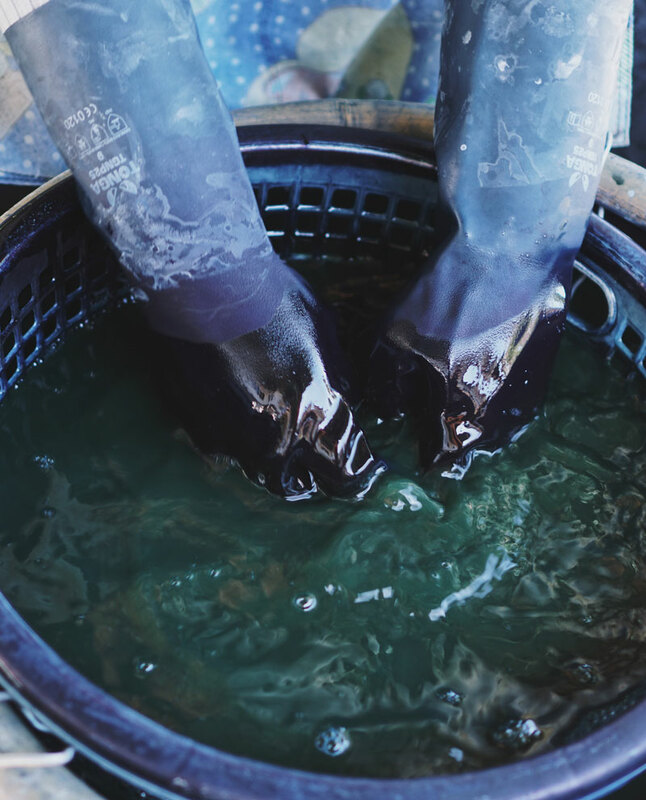 The next day you’ll introduce slate lime into the vat (a large tank or tub used to hold the dye), which will give the colour pigment something to hold onto when you beat the water with a stick to introduce oxygen into the solution. After 30 minutes of beating, the indigo pigment starts to bond to the slate lime inside the vat. The next day the pigment sediment will have settled to the bottom. You then strain the excess water, leaving you with a mush or an indigo paste. This is the paste you use to make a new indigo dye vat. For a dye vat with 20L of water, you use about 10/15kg of mush. The vat is like a living culture that you must maintain every day. Inside the vat, you can put in many different natural ingredients which will alter the final result of the colour (anything from tamarind juice or liquor). This process can also be done with a chemical (sodium hydrosulphite) to speed up the process. We’re experimenting with both techniques. Using natural ingredients to ferment the dye is very unpredictable and it can take up to 7-10 days to actually ferment. At our studio, we do all our dyeing with natural dyes. We started off with indigo because that is the obvious pairing with this technique of Shibori and is what we learnt in Japan. 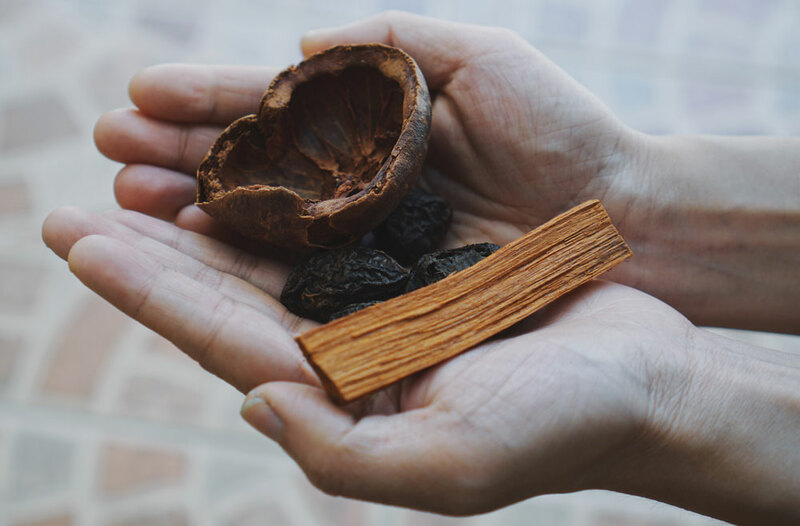 Some of their natural dyeing ingredients. What is your preferred Shibori technique? Serge: I have to admit that after years of doing it, I think anything that’s easier! 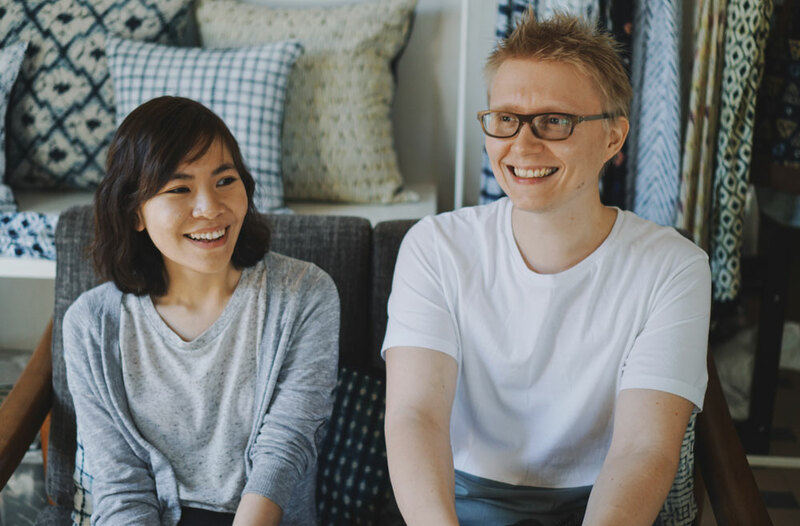 We don’t have as much time to do this as we have to run the business side of our brand but when we do, my favourite technique is the one we don’t know yet (we like to experiment a lot). You can either break all the rules (using unconventional tools or materials) or you can use a standard technique as a base and make small variations in the lines, angles, stitching and the tension of the string when you pull the threads leads — all of this makes a massive difference to the end result. Ann: A lot of the time we find inspiration from experimenting with various techniques — the unexpected outcome leads to fresh new ideas. 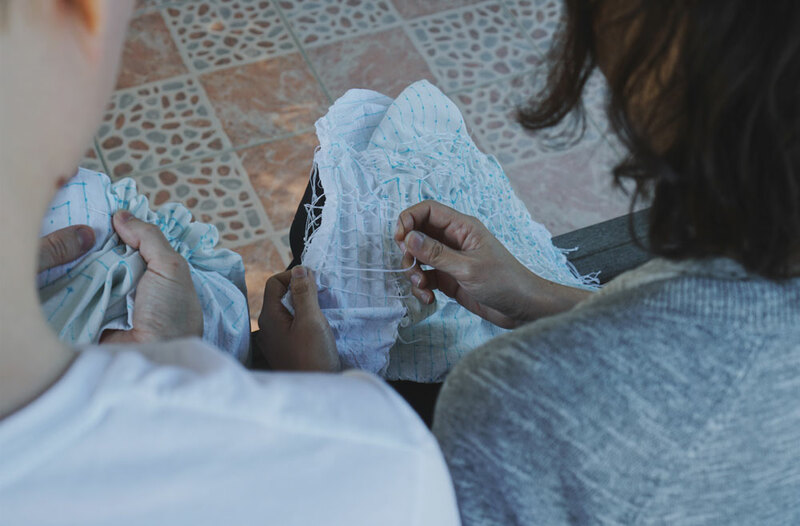 We’ve also tried drawing visual inspiration from African baskets but with Shibori, we’ve realised that there are limitations — it’s just needle and thread, you stitch the fabric and you compress it. Within that, we’re trying to push the boundaries more and more but we’re realising that we don’t want to be stuck only doing this technique forever. Serge: Japanese techniques are one of our biggest sources of inspiration. Although Shibori has been our main focus for a number of years, we want to expand our product offering to different textile techniques. Recently, we’ve been thinking of stencil dying (it’s similar to the batik technique of heating up wax and drawing on the fabric with hot wax). The Japanese have a similar method but it involves the use of stencils (steamed sticky rice paste is pushed through stencils, which are pieces of waterproof paper that have designs cut into them). We’ve been playing with that for a while. Some of their cushions showcasing the natural dying techniques. An example of the Japanese stencil dyeing that uses sticky rice. Ann: We had no background in business so it’s a huge learning process for us. We’re still involved in the designing and the technicality of dyeing but are upskilling our staff to slowly work their way from a simple to a more complicated pattern. The idea is to free ourselves up to have more time to create new things. Serge: Because we’re new, over the last year, we’ve been saying yes to as many things as we can. We’ve made a decision to cut back a little from that this year as we’ve felt like we’re trying to do too much and are concerned we’re moving more into mass production. We’re aiming to have a dual approach to our business: a scalable mass product on the one end and boutique, one-off pieces on the other side. Ann: I’ve learned in the past year that if we want to keep doing what we love, our business needs to survive financially. As a result, we might have to do things we’re not totally crazy about, like sales. Also, as much as we want to go and experiment with new things and be as creative as we want, we need to be thinking about how we can get money to flow consistently every month. Is there a piece of advice that you’ve been given that has stuck with you? Serge: After the Fukushima nuclear reactor blew up in 2011 there were a lot of artists in that area (potters, painters, sculptors and wood workers) who started to take on this message of ‘anti-nuclear’ and it became this thing. I was learning in that environment and from the very beginning, I never felt like I had anything strong to say, which gave me a lot of anxiety. I spoke to my Shibori teacher and he advised to never start worrying about the message of your work because you’ll find yourself in an area where people start fighting and competing over whose message is more important. This approach leads to work becoming quite conceptual and it can become a very dangerous thing. He explained to me that I’m creating in this age and trying to make a living from beautiful things. Just the very fact I’m doing that, in itself, should be enough of a message. That’s been the biggest piece of advice that has stuck with me. Photograph by Slow Stitch Studio. 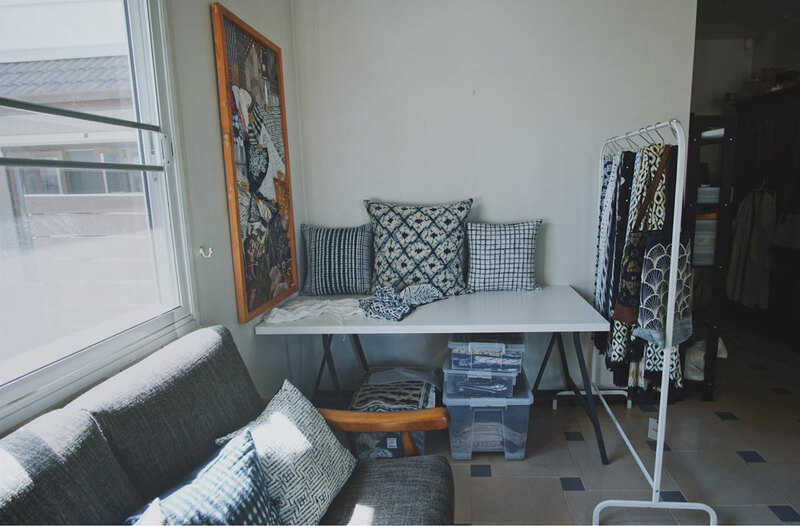 Ann and Serge | If you ever find yourself in Chiang Mai, be sure to step into the Slow Stitch studio and explore the many textile accessories they have individually crafted.